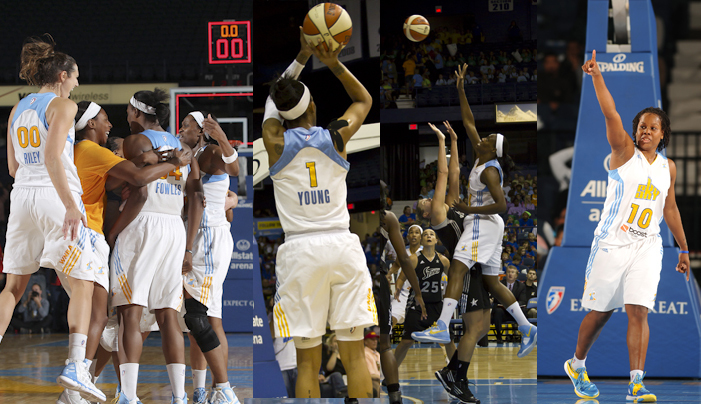 What a thrilling season for the Chicago Sky. With a revamped roster, a first year head coach and unexpected injuries, the 2017 Sky turned what many thought would be “a rebuilding year” into a record-breaking year in individual and team career-highs and milestones. General Manager and Head Coach Amber Stocks, joined the Sky from the 2016 WNBA Champion Los Angeles Sparks coaching staff. Her winning ways and competitive edge brought a contagiously exciting atmosphere. 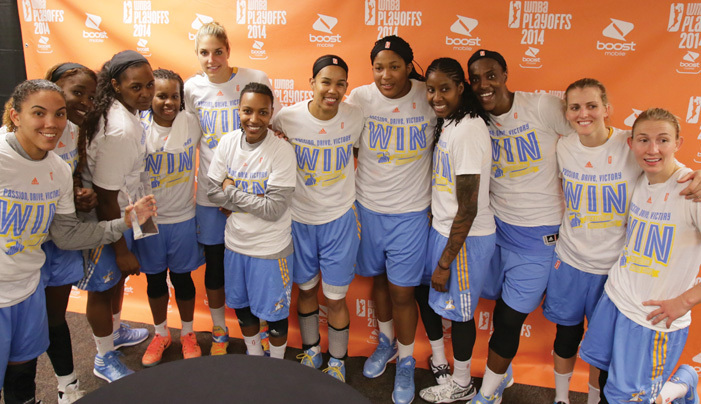 The Chicago Sky’s season can be summed up as a tale of two halves. During the months of May and June, the Sky held a 6-9 record. Following the Olympic break, all 12 players returned refreshed and opened the second part of the season with a 4-0 start. In the final three months of the season, Chicago notched a 13-7 record. Prior to the start of the 2015 season, the Chicago Sky welcomed veteran Cappie Pondexter after a headlining trade which involved sending Epiphanny Prince to the New York Liberty. 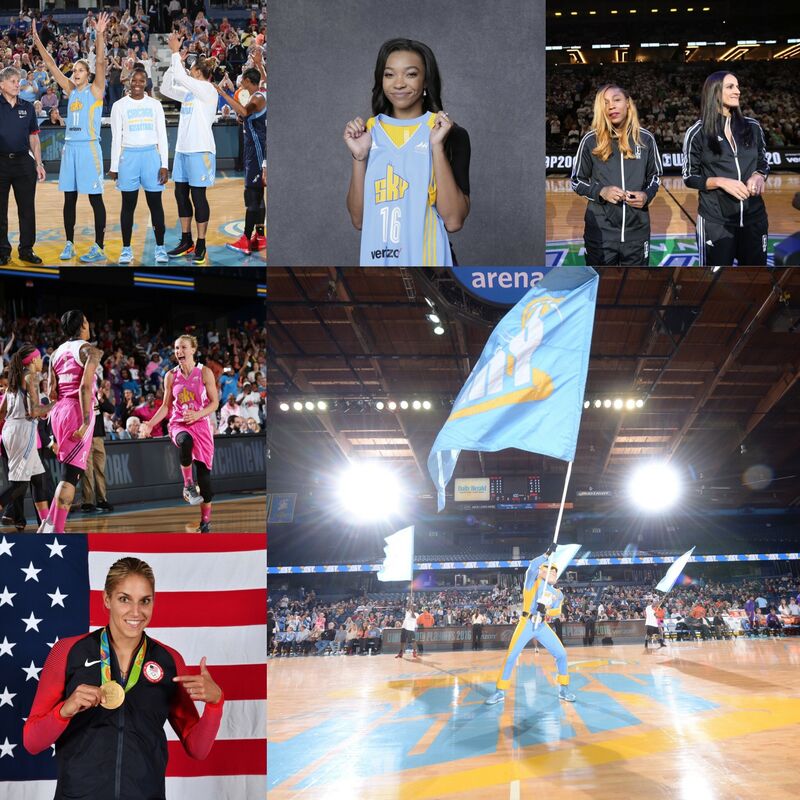 The Sky’s 10th season kicked off with the revealing of the first Sky banner in the rafters of Allstate Arena – the 2014 WNBA Eastern Conference Champions banner. 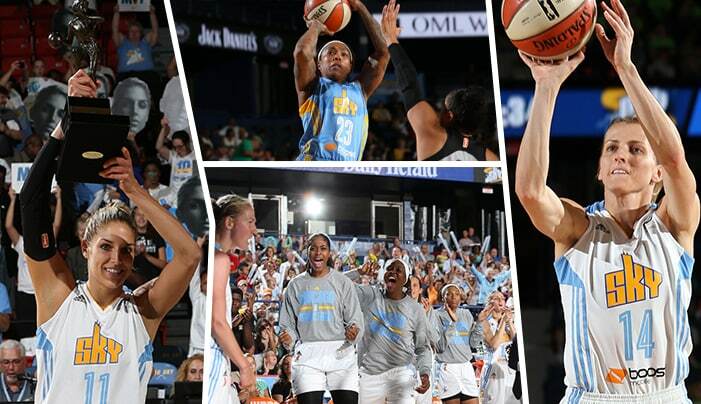 The reigning Eastern Conference Champions, along with several new Sky players, returned to Allstate on June 5 for opening night against the Indiana Fever. Elena Delle Donne scored 31 points in the Sky’s 95-72 victory over Indiana. The following night, Delle Donne posted a then-career high of 40 points on the road at Tulsa. Following its first ever playoff run in 2013, the Chicago Sky entered the 2014 season with a confident young roster, ready to build on its previous success. To go along with a combination of returning superstars, including 2013 Defensive Player of the Year Sylvia Fowles and 2013 Rookie of the Year Elena Delle Donne, the Sky brought in many new faces, all of whom were eager to help the team return to the postseason. The 2013 season brought a rookie superstar to the Sky’s already strong roster, putting the team on track for another successful year. The Sky started the season with a bang, using its second overall pick in the 2013 WNBA Draft to select Elena Delle Donne, a 6’5 guard/forward from Delaware. Delle Donne, one of the league’s “3 To See” in 2013, was a highly anticipated addition, and her dominant play helped the Sky reach new heights in 2013. 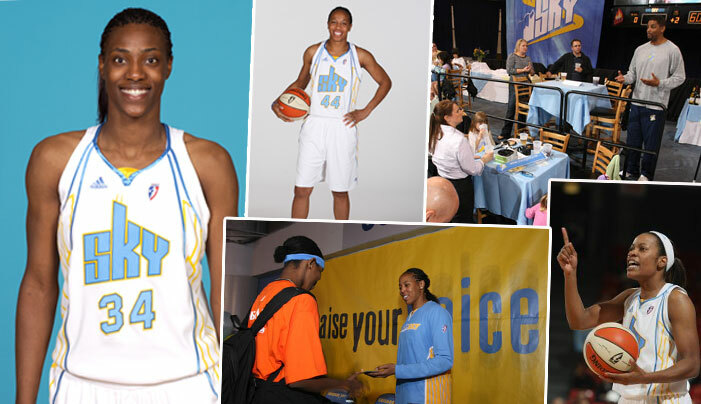 As one of the most active wheelers and dealers last offseason, the Chicago Sky entered the 2012 campaign with returning the 2011 Defensive Player of the Year in superstar center Sylvia Fowles, and another pair of All-Stars in guards Epiphanny Prince and Courtney Vandersloot and snagged Swin Cash, from Seattle as well as two-time champion Le’coe Willingham. And, not least of all, they brought in Ticha Penicheiro, one of the WNBA’s Top 15 greats, in addition to Ruth Riley. 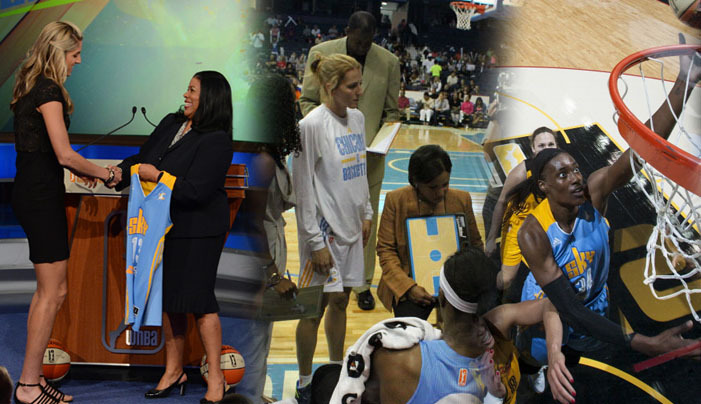 2011 again saw more change for the Sky as our fourth Head Coach & GM, Pokey Chatman was introduced to Sky fans as their new leader in October 2010. 2011 was also the year of Sylvia Fowles. She spent the season breaking franchise and WNBA records. In her fourth season in the WNBA, Fowles proved once again to be a true student of the game as she continued to make improvements to her game. In 2010, the Sky’s biggest move took place when they relocated their home to Allstate Arena in Rosemont, IL. The Sky went 14-20, recording 7 wins and 10 losses both home on in their new venue and away. This year saw big-name player trades, breakout performances, and exciting rookies. The season started with many new faces including Cat Kraayeveld and Shameka Christon who the Sky acquired from New York in a blockbuster 3 team trade. 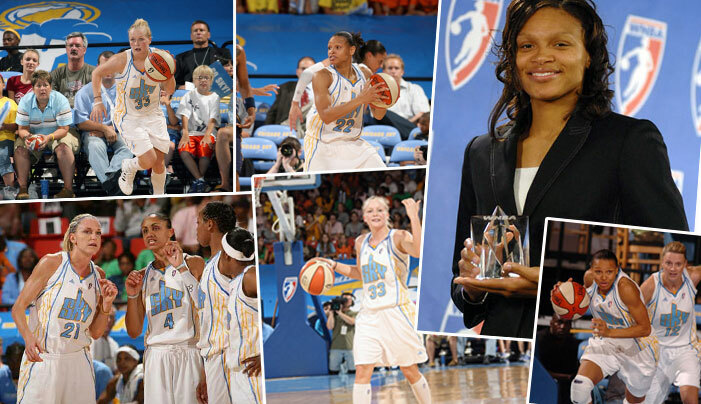 2009 proved to be one of the most exciting years for the Chicago Sky. Its overall record improved from the 12-22 in 2008 to 16-18, the best record in Sky history so far. At home, the Sky had a winning record of 12-5. Head Coach Steven Key’s remained at the helm and his coaching values of work ethic and willingness to improve shaped this team into a formidable opponent. This season saw the arrival of a highly touted rookie center out of LSU, Sylvia Fowles, with the second pick and also another change in leadership with Sky Assistant Steven Key being named Head Coach & General Manager. The Sky also continued to fine tune their roster and add the pieces of the puzzle that would bring them stability and players to grow with in the coming years. 2007 was a new year, with a new Head Coach, and some fresh new faces including Chicago native Dominique Canty, free agent Kayte Christensen, Claire Coggins, Chasity Melvin and rookies Armintie Price & Stephanie Raymond who graduated from Northern Illinois University. The addition of Head Coach Bo Overton and rookie sensation Price proved to be beneficial as the Sky’s record improved to 14-20. 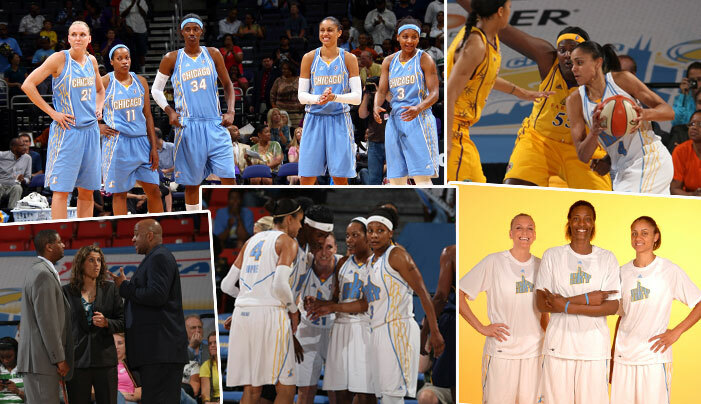 In its inaugural season, the brand new Chicago Sky hosted a roster led by a mix of players from various WNBA teams. 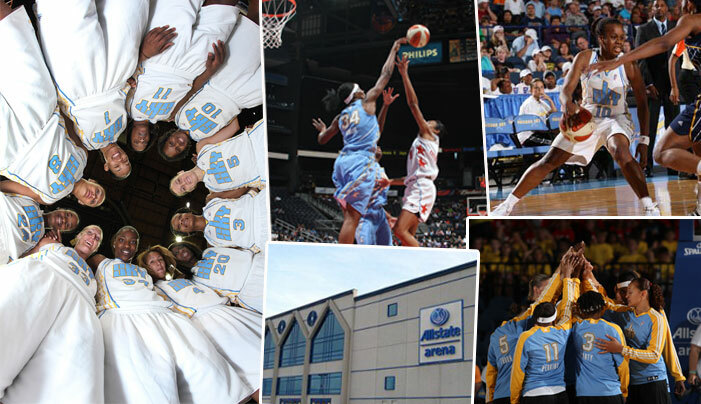 Following an expansion draft held in late 2005 the the first roster of players put on the inaugural Chicago Sky jersey in the summer of 2006.